Mr. Clayton noted that, “One element that gives USDA pause is that the across-the-board cuts take effect March 1, but USDA’s signup period for the direct and counter-cyclical payment programs begins Feb. 19. Under the sequestration, agencies are expected to honor legal agreements, such as Conservation Reserve Program contracts. That could be interpreted to include a producer’s current enrollment in farm programs as well. Meanwhile, Hembree Brandon reported yesterday at the Southeast Farm Press Online that, “Congress’ failure to enact a new farm bill last year ‘isn’t all bad,’ says Daniel Ulmer, legislative assistant to Sen. Thad Cochran, R-Miss., because the extension of the 2008 legislation continues direct and counter-cyclical payments and milk supports. “‘The USDA recently announced that signups for the programs will begin Feb. 19,’ he said via a video link to the Mississippi Farm Bureau Federation’s annual commodity conference. Yesterday’s article also pointed out that, “While he says Cochran ‘hasn’t gone into detail yet about what he wants to change in the farm bill passed by the Senate last year, I think we can expect he will continue to oppose its regional inequities and its one-size-fits-all approach in the commodity title. More specifically on the sequester issue, Erik Wasson and Bernie Becker reported yesterday at The Hill’s On the Money Blog that, “Senate Minority Leader Mitch McConnell (R-Ky.) said Tuesday that $85 billion in automatic spending cuts will likely go into effect on March 1 despite opposition in both parties. The Hill article noted that, “Rank-and-file Democrats expect to be briefed Thursday on the Senate Democratic sequester-replacement proposal, which [Senate Majority Leader Harry Reid (D-Nev.)], Finance Chairman Max Baucus (D-Mont. ), Appropriations Chairwoman Barbara Mikulski (D-Md.) and Budget Chairwoman Patty Murray (D-Wash.) are all working on…[I]n addition to the Buffett Rule, Democrats are discussing a variety of ways to reach the $120 billion in deficit reduction, including cutting farm subsidies known as direct payments. Scott Wilson reported in today’s Washington Post that, “[Pres.] Obama and congressional leaders have been unable to reach agreement on how to avert the cuts, which the president warned Tuesday would fall hardest on those who can least afford them. Ramsey Cox reported yesterday at The Hill’s Floor Action Blog that, “Sen. Chuck Grassley (R-Iowa) announced Tuesday that he would introduce a bill to place a cap on payments an individual farmer receives in a year. For more information on the proposed legislation, see this brief summary, as well as this “Q and A” item. Chris Clayton reported yesterday at DTN that, “A reoccurring theme at the Crop Insurance Industry annual meeting this week is ‘do no harm’ as insurance agents, company officials, farmers and agricultural lobbyists gather to talk about the state of the industry. “Without passage of a farm bill last year, crop insurers see a greater risk of more cuts to their programs despite taking billions of dollars in cuts three years ago when USDA renegotiated its contract with the industry. Insurers also took cuts in the 2008 farm bill. An update yesterday from National Crop Insurance Services noted that, “Last year’s drought put the country’s crop insurance system to the test, but the public-private partnership passed with flying colors, USDA Under Secretary Michael Scuse said today at the 2013 crop insurance annual conference. “During the disaster, Scuse traveled across rural America and gave farmers business cards with instruction to call if there were any problems or concerns about crop insurance or the speed of assistance delivery. Bloomberg writer Brian Wingfield reported earlier this week that, “An Iowa senator demanded the U.S. Army Corps of Engineers explain why it refused to use Missouri River water to replenish the drought-stricken Mississippi a day after it approved releasing water for oil drilling. The FT article stated that, “Selling has snowballed since the US Department of Agriculture raised estimates of global corn, soyabean and wheat stocks in a report late last week. 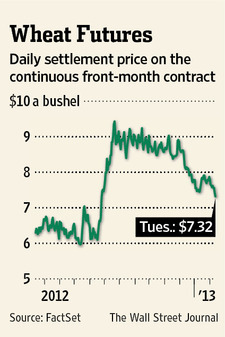 South America is expected to produce record corn and soyabean harvests just as stocks in the US run low. And Bloomberg writers Luzi Ann Javier & Oliver Renick reported yesterday that, “In the U.S., the world’s largest exporter, [cotton] planting will slump 16 percent this year to 10.32 million acres, the least since 2009, according to the average of 13 analyst estimates compiled by Bloomberg. Acreage may plunge 27 percent as farmers shift to more profitable crops, the Memphis, Tennessee-based National Cotton Council said on Feb. 9. Vicki Needham reported yesterday at The Hill’s On the Money Blog that, “Two of the Senate’s top trade lawmakers outlined their priorities for a free-trade agreement between the United States and the European Union ahead of the expected start of talks. Also yesterday, Julie Harker reported at Brownfield that, “The National Farmers Union (NFU) and the United States Cattlemen’s Association (USCA) say changes to Country of Origin Labeling (COOL) legislation are not needed to comply with the recent WTO ruling on COOL. Courtney Weaver and Emiko Terazono reported yesterday at the Financial Times Online that, “Russia is likely to suspend duties on grain imports by the end of March, lifting the import tariff until the summer as domestic wheat prices [related graph] hit record levels following last year’s poor harvest. Vicki Needham reported last night at The Hill’s On the Money Blog that, “The United States and Europe will launch talks on a trade deal that if completed would form a $5 trillion trans-Atlantic free-trade zone.